In 2002, John McGovern, busy documenting the First Tongue in Australia, located pictures of inscriptions from the what is believed to be The Queen of Sheba's archaeological site in Yemen. The language on the wall, although stylized into a font, appears to be First Tongue. Click HERE to see a recently uncovered panel and our attempt at a meaningful translation. Additional translations of a stone, partially buried in the sand and unexcavated, are attempted HERE. We suggest that this ancient alphabet was used much as Latin inscriptions and Roman Numerals are used on contemporary dedication plaques. 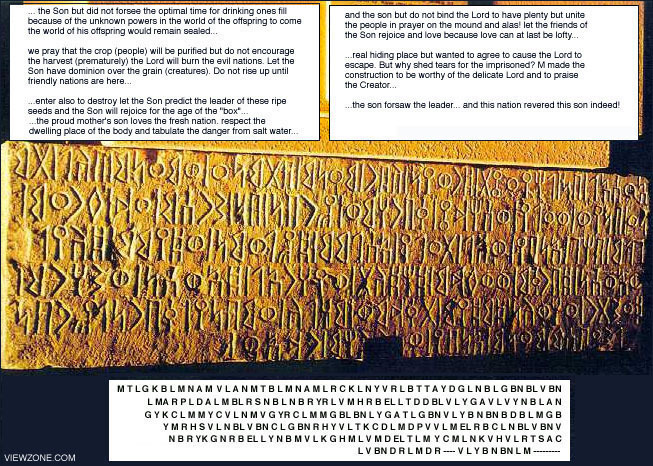 A dead language never changes and is therefore constant through time. 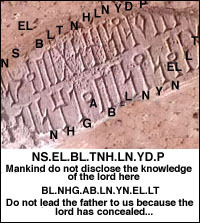 This stone was photographed as it is displayed in a prominent museum -- upside down -- with no idea of its translation or alphabet. A similar alphabet later developed in Ethiopia but misread many of the ligatures as letters and replaced many sound values with new sounds to accommodate an Arabic dialect. This is still in limited use today while this older form is used exclusively for religious and official writing. 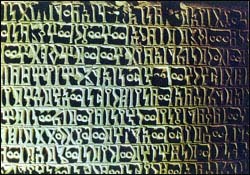 The Ethiopic script translates using Arabic dialects instead of Semitic. Using the First Tongue, Semitic root language and symbols, we can arrive at a somewhat fluid and lucid translation with some historical flavor. The stone has been trimmed on both ends and notched in the center and appears to have been used as a building stone subsequent to its creation as part of a significant narrative mural. The resulting translation lacks these additional symbols making a precise translation impossible. We hesitate to use the term "Semitic" because it really does not represent the root language that eventually evolved into what is commonly known as Semitic. We choose to call this "First Tongue" since it has been found in Australia, Chile and the United States with dates as old as 8000 BCE! The use of this script and dialect on this important construction appears to resonate with the contemporary use of Latin, Greek and other "dead languages" on public buildings, currency and official insignias. Anyone who scrutinizes our work as it is presented here will acknowledge the intent of these inscriptions. We have intentionally been inexplicit in these details. Please review the on-going work in the links provided below. The Mahram Bilqis contains priceless documents, artifacts from the time of the biblical queen. A Canadian archaeologist said on Tuesday that his team was slowly unravelling the secrets of a 3,000-year-old temple that may have belonged to the Queen of Sheba. Half-buried under the sands of the southern Arabian desert in northern Yemen, the Mahram Bilqis or Temple of the Moon God contains priceless documents and artifacts from the time of the biblical queen. The Yemeni government does not have control over the various tribal groups that live in the country and who believe that they own the land'The temple was a sacred site for pilgrims in Arabia from around 1200 BC to to 550 AD, the time that fits with history's record of the Queen of Sheba and her visit to King Solomon of Israel. "To have such historical, religious and cultural connection to one site is tremendous. Not often in archaeology do we have that." Professor Bill Glanzman the project's director told Reuters. The discovery and excavation of the temple began in 1951 by the late American archaeologist Wendell Phillips. But it was halted abruptly a year later because of political unrest. Work was restarted in 1998 by the American Foundation for the Study of Man, a nonprofit organisation that spearheads such projects. Surprisingly, Phillips and Jamme, in the 1950's, remarked that some of the oldest scripts in Yemen seemed to have proto-Canaanite characteristics and did not translate using Arabic dialects. The team were ousted from Yemen before this could be explored. Curiously, none of the subsequent research -- including the present work at the Temple Bilquis -- has attempted to apply this method to the texts. Glanzman, leader of the recent University of Calgary expedition to Yemen, said the Bilquis Temple could become an "eighth wonder of the world," attracting people from around the world. But another expert disagrees. 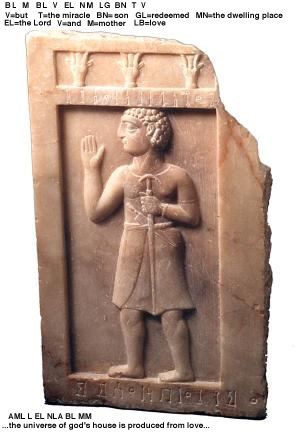 "This is the most optimistic of statements at the moment, given the economic and political situation and the problem of raising money for such things," said Edward Keall, senior curator of Middle Eastern Archaeology at the Royal Ontario Museum in Toronto. "I do not expect to see it in my lifetime," he said. "As of the moment, the Yemeni government does not have control over the various tribal groups that live in the country and who believe that they own the land," Keall said. But Glanzman tries to sell the importance of the excavation, saying it is as important a discovery as the ruins of Pompeii, the pyramids of Giza or the Acropolis. "The sanctuary is packed with artifacts, pottery, artwork and inscriptions, opening a new door to the ancient civilisations of southern Arabia," he said. Glanzman said his team could be finished with the excavation within 15 years.